Here's a book for all Seigokan members and friends. 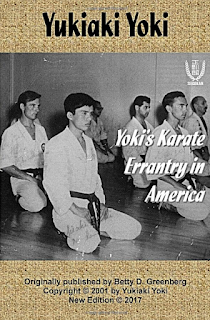 It's the first paperback (and newly revised) edition of "Yoki's Karate Errantry in America," which was originally published in 2001. This is the story of Yukiaki Yoki Sensei's travel to the USA in 1964, when he trained at the Mattson Academy of Karate in Boston and participated in the All American Karate-Do Championship. We know Yoki Sensei as Seigokan Overseas Head Director from 2001 to 2008. According to his biography, he was born in 1943 at Osaka, Japan. He graduated from Kyoto University of Foreign Studies, and was karate Champion in Western Japan Tournament in 1963. He later introduced Seigokan Karate-do to Hong Kong. This is a fascinating story as it describes the cultural differences between Yoki Sensei and his hosts in Boston, and provides an outside perspective on the early development of karate-do in the USA. I was especially interested (being from Boston) because I had the opportunity to compete with Mattson Academy students in the 1970s. Several names mentioned in the book were familiar to me. I definitely recommend getting your copy soon.